PESHAWAR, (UrduPoint / Pakistan Point News - 17th Apr, 2019 ) :In view of persistent virus circulation in sewage water of the provincial capital, the district administration of Peshawar has decided to conduct special anti-polio campaign wherein children upto 10 years of age will be vaccinated against the crippling disease. About 1.64 million kids up to 10 years of age to be vaccinated in April campaign and decision regarding increase in age bar has been taken to help stop virus circulation in city, said Deputy Commissioner Peshawar, Dr. Imran Hamid Sheikh. "Over all a total of 7.62 million children to receive OPV in KP and tribal districts," he added. Addressing a press conference here Wednesday at Emergency Response Unit (ERU) Maulvi G Hospital Peshawar, Dr Imran Sheikh said that polio eradication is national emergency and district administration is leading the programme with the technical support of partners at the district level. Also present on the occasion were Director EPI Dr Akram Shah, ADC Shahid Ali, District Health Officer Peshawar Dr Gul Muhammad, Coordinator ERU Inayat Atta, representatives of UNICEF, WHO and BMGF. DC Peshawar said that normally the age bracket for polio vaccination is under five but in areas with poor sanitation conditions and congested population elder children are one of the key factors that contributes to virus circulation. Therefore, he added that the district administration has decided to increase the age bar of children to 10 years for polio vaccination in the upcoming campaign starting from April 22, next in Peshawar. He said that expanded age vaccination was piloted in some union councils of Islamabad where environmental sample was positive and it delivered the desired results by interrupting the constant circulation of virus. In view of the above, he added that the district administration of Peshawar decided to replicate the Islamabad model in Peshawar by vaccinating children up to 10 years of age so that the constant circulation of virus can be interrupted. Polio eradication is the government run programme supported by international partners and it was the right of our children to stay healthy, he opined. Director EPI Dr Akram Shah said that polio vaccine is completely safe and every additional dose boost the immunity of children against the crippling disease. He said that polio eradication is the biggest public health programme run by the government adding that millions of children have been protected from lifelong disability through vaccination. Provincial manager of EPI held an appeal to parents and people from cross segments to play their due role in defeating the virus and ensuring healthy life to the children of the globe. 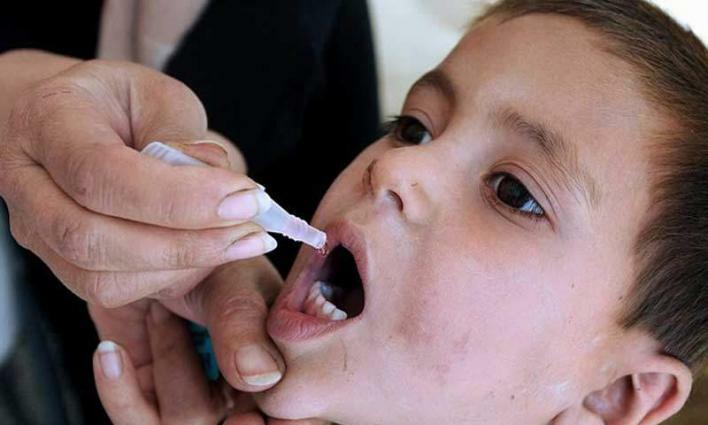 Meanwhile, anti-polio drive will be launched in the province along with the merged districts from April 22, 2019 where in over 7.6 million children will be immunized against polio. According to EOC data a total of 27252 teams have been constituted to vaccinate the children out of which 23455 are mobile teams, 1861 fixed teams, 1127 transit while 809 are roaming teams. More than 6000 area in-charges have been deployed to ensure quality campaign and monitor performance of teams. Likewise, 34219 law enforcing personnel have been deployed to provide security to the teams and to avert any untoward situation.